Laut mmo-champion.com wird es mit Patch 5.2 zwei neue World Bosse geben: Nalak und Oondasta. Arc Nova – A pulse of electric energy inflicts 350,000 Nature damage to players within 35 yards and knocks them back. Lightning Tether – Nalak tethers several players to him, inflicting 10,000 Nature damage every 1 sec. and an additional 20,000 Nature damage if they are greater than 30 yards from Nalak. Lasts 15 sec. Static Shield – Jolts of power surrounding Nalak inflict 20,000 Nature damage every 1 sec. to a random player. Stormcloud – Nalak places storm clouds above several players, which inflict 50,000 Nature damage every 3 sec.to all players within 10 yards for 30 sec. 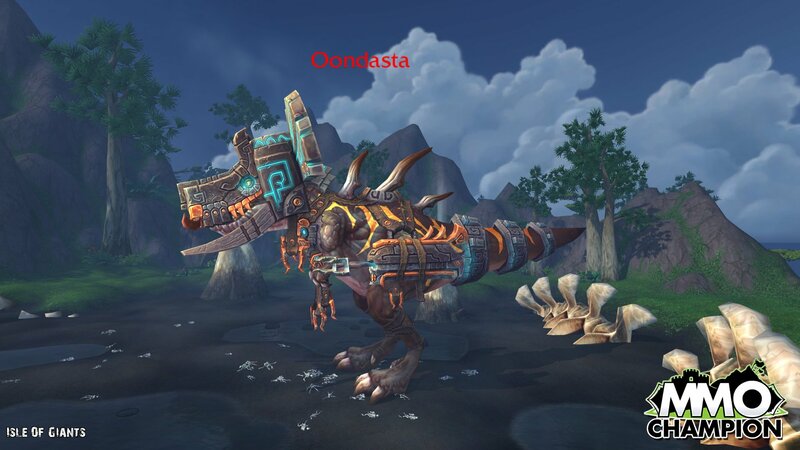 Crush – Oondasta crushes his current target, inflicting 500,000 Physical damage and reducing armor by 25% for 60 sec. This effect stacks. Frill Blast – Oondasta’s armor is more than just for decoration, and can charge up this powerful blast that inflicts 800,000 Fire damage to all players in a 60-yard hemisphere in front of Oondasta. Growing Fury – Oondasta’s rage grows as the fight progresses, increasing all damage by 10%. This effect stacks. Piercing Roar – Oondasta unleashes a piercing roar, inflicting 200,000 Physical damage to all players and interrupting spell-casting, preventing spells of that school from being cast for 10 sec. Spiritfire Beam – Oondasta fires a beam of spiritfire energy at a player, inflicting 150,000 Fire damage and jumping to a nearby ally. Up to 20 players can be affected, with damage increasing by 50% with each jump.